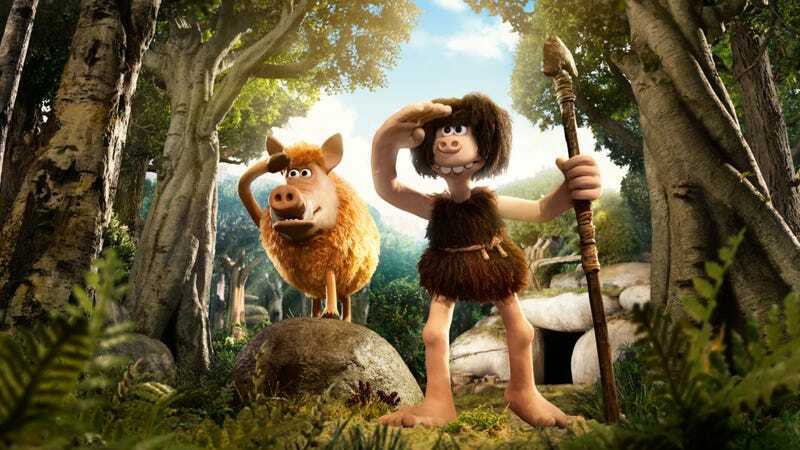 Nick Park, the creator of Wallace & Gromit, doesn’t try to reinvent the wheel in Early Man, a prehistoric underdog sports spoof that pits dumb-as-rocks Stone Age cavemen from what is now the English soccer mecca of Manchester (yes, the title is a pun) against Bronze Age Euro snobs, indulging some of the silliness that made his short films such classics. Of course, the animation of Aardman, the British studio that Park has called home since the late 1980s, remains delightful in its blend of lavishness and hobby-ishness, with stop-motion plasticine characters smudged in fingerprints and lint. (However, some attempts to add digitally animated extras into the mix end up looking off-putting and cheap.) 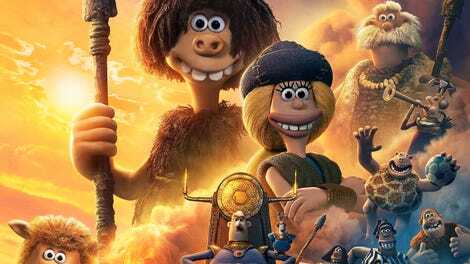 But for all its humor, Early Man can’t overcome the limitations of its premise—one of Park’s less fruitful genre mashups. Its hero is the scruffy, pig-nosed, mop-haired Dug (Eddie Redmayne), the youngest of a happy-go-lucky tribe whose valley is invaded by Lord Nooth (Tom Hiddleston, sounding cartoonishly French), a bald autocrat with a schnoz like a zucchini. While the rest of the tribe are kicked into the nearby badlands, where giant saber-toothed ducks still roam, Dug and his suspiciously Gromit-like pet boar, Hognob, steal away into the Bronze Age metropolis. It’s an under-realized setting, though Park and writers Mark Burton and James Higginson manage to have some fun with Flintstonian technologies like a voicemail bird (impressionist Rob Brydon, who also voices two more characters) and puppet-based instant replay. But it’s here that Dug stumbles upon—or more accurately, straight into—the game of soccer, dominated in these prehistoric times by Nooth’s Real Bronzio FC. The sport, it turns out, was invented generations ago by Dug’s people. But they’ve long since forgotten how to play and have come to assume that the little hexagonally patterned balls in their sacred cave paintings were just poorly drawn rabbits or possibly an extinct species of circle. Again, they’re not the brightest bunch, even with the guidance of their fatherly chief, Bobnar (Timothy Spall), a white-haired old man of 32. But, in a last-ditch effort to get back their land, Dug challenges the Bronze Agers to a match, training his tribe with the help of Goona (Maisie Williams, with a wandering Scandi-German accent), a Bronze Age girl who’s long dreamed of playing the male-only game. Aardman’s most entertaining output has come from offbeat material—whether in the studio’s first feature, Chicken Run (co-directed by Park), a riff on wartime prison-break movies set at a farm, or Park’s “The Wrong Trousers,” a Hitchcock homage with a sinister penguin for a villain. But Early Man is structurally a straightforward sports comedy, right down to the training montages. Dug’s tribe even stitch makeshift uniforms in red and white, the current home colors of Manchester United. Meanwhile, the unscrupulous Real Bronzio wear European Union blue and gold. In a post-Brexit world, this stuff isn’t subtle: Europhobia, literal tribalism, plus a rah-rah for the authenticity of U.K. soccer. (Now with slightly less glassing!) Which is to say it’s too earnest about its hokiest plot beats to completely embrace its slapstick potential—unlike, say, Park’s Wallace & Gromit films, which swerve more zanily. Here, the charm is in the sidelines.